On the 25th May, I will do a stand-up-and-teach event at a local fundraising Spring Fair in Lausanne, for half an hour or so. People don’t know what to expect, and I have no idea who will be there, if anyone! Skill levels unknown. I thought I might get people to make a simple four-patch by hand, and then assemble them all later into a baby quilt to be sold at the Christmas sale later in the year. 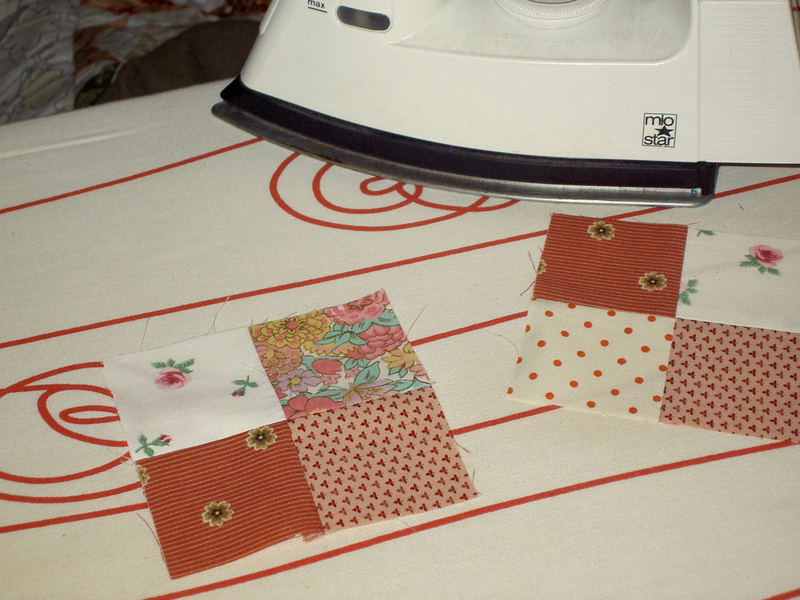 Now I think I will quick-piece a baby quilt to show off what happens after these blocks are made, what a quilt sandwich is, and what ‘quilting’ is, by hand or machine. I will also sew two strips together, and chop them up by rotary cutter, to show the folks that there is also a quicker way of doing this than sewing it all by hand. Quite enough for half-an-hour, don’t you think? Hopefully people will enjoy this, and then feel sufficiently rested to go back to buying jam / eating cakes / resisting brocante. Learn how to quilt your own quilts with Leah Day!